I am writing from Austin, Texas, at the Texas Unites for Animals conference. This is unlike any conference I have ever been to before, for a couple of reasons, and both of these reasons really impress me (excuse me while I take off my social media hat and put on my 100% animal welfare hat for just a moment). This is the first conference I’ve been to where the majority of attendees are from nonprofit animal shelters and city/county animal control services, NOT small, independent rescue groups. To see the animal control officers and personnel here in such great numbers is truly inspiring. These are the people who deal with the heartbreaking issues of pet overpopulation, abuse, neglect and euthanasia every single day. They can offer a perspective that no one else can, and to see those folks here, participating in this dialog, is really a step in the right direction. The second impressive thing is that all these organizations are here together, talking to each other, sharing ideas. Represented here are small “mom and pop” rescue groups, breed rescues, big humane societies, small humane societies, city animal control, county animal control and everything in between. And they’re actually talking to each other! 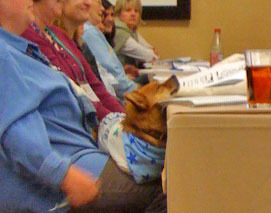 I had to steal a picture of Sharri Boyett's dog...he was really enjoying the seminar today! I want to thank everyone who came to my seminar today at the conference. You were a fantastic, attentive, engaged audience, and I feel like it’s one of the best seminars I’ve had so far! Many people think we aren’t going to be able to accomplish the tough but worthy goals of reducing (or even eliminating) the euthanasia of healthy, adoptable animals in the southern states. I’m from Oklahoma, so I hear it too. Thanks also for the great suggestions you gave me today about things you’d like to see blogs on. You had some great suggestions about adding information about Craigslist to my coverage of social media. You’re absolutely right; this is a tool that many individuals and shelters are using to rehome animals. I am going to do some research on tools that would most benefit us and help us in our outreach on Craigslist and get back to you. I also will present some information on photo editing software and techniques, as well as some information on video format conversions for uploading to Petfinder and other sites. My goal is to give you information and tools that, if you use them, will make your life and work easier and more efficient. We talked a bit about the crazy stuff going on behind the scenes with Petfinder/Petango/Petpoint and your frustration with not being able to automatically or batch upload your animal updates into Petfinder if you are using Petpoint software. I am talking to both groups about a solution for this. It really only hurts the animals in the long run if you can’t get these pets seen by the largest number of potential adopters. That’s what it’s all about! I will keep you updated on these conversations and let you know what is in store. We are going to figure something out to make this work. Thanks again, Texas! I thoroughly enjoyed my time in Austin and will come back soon for a more recreational visit. I enjoyed meeting each and every person I met this weekend. If you weren’t able to attend my seminar (there were many other good ones going on at the same time!) feel free to drop me a line and I’d be glad to send you my notes. As is the tradition with TheSocialAnimal, please continue to come back. Post your questions and ideas and musings. The purpose of this site is for us to learn together. I may be “the expert” on this particular subject, but we can all learn from each other. And I don’t know what will help you most if you don’t ask. So comment, post, write me an email and we’ll walk through all this new media together! 2 Responses to Howdy From Texas…Unites For Animals! Emily, I am from Austin and had no idea they had this conference! I wanted to share a web site with you. It’s http://www.horse-dogandcat-paw-wow.com/. Horse, Dog and Cat-Paw-Wow’s Mission is to connect pet owners local to nationwide, and across the globe, on anything & everything helpful to pets and their owners. We connect you with “real people” who love their pets as much as you do- online and in person. Here we provide a sense of community, and support among pet owners from your home to across the globe. I’ve really enjoyed the site and since you are an animal advocate I thought you and your readers might as well. You should DEFINITELY attend Texas Unites for Animals–it’s a fantastic conference. It’s really one of the best I’ve ever attended, and I go to conferences all over the country! Plus, as you know, the weather’s great in Austin in March!